The #1 Horse Industry Information Advertising Directory! Contact Ann to include your company. ForeRunner™ by ForeFront Equine, LLC. The results are AMAZING! ForeRunner™ is an ideal pre/post performance paste which provides the horse with the means to calmly focus on the job at hand, without effecting speed or making it dull. ForeRunner™ is truly one-of-a-kind! A state-of-the-art all natural supplement paste containing Colostrum, prebiotics, equine specific probiotics, electrolytes and BeneCell®. ForeRunner™ is an ideal pre/post performance paste which provides the horse with the means to calmly focus on the job at hand, without effecting speed or making it dull. Is It True I Can Use ForeRunner™ For Showing and It Will NOT Test? That's right! In fact, many trainers use ForeRunner as their "secret partner" while showing because of the ability it has to calm the horse so he can focus on the task at hand without feeling drugged or tired. The all natural ingredients in ForeRunner™ are show safe and won’t test, it’s a favorite amongst knowledgeable exhibitors... try it once and it will become your favorite too! What Sets ForeRunner™ Apart From Competitors? First and foremost, ForeRunner™ is ALL NATURAL, made in America and from the highest grade ingredients possible. Each ingredient is independently certified prior to being blended and is derived from sustainable and ethically sourced means. There are no fillers or additives in any ForeFront Equine supplement, just 100% certified pure product. Each ForeRunner™ Paste is affordable and offers multiple doses per tube making it a convenient product to keep in your tackroom and trailer. Additionally, ForeRunner™ contains BeneCell®, a proprietary ingredient which enhances oxygen uptake, reduces lactic acid build-up while helping the body produce cells rapidly during times of stress. How Do I Know If I Need Forerunner™ Paste? All horses benefit from ForeRunner™. Whether you have a hardworking performance horse travelling regularly to competitions or a retired Pleasure or Trail mount that mainly receives weekend use, ForeRunner™ is a key product to keep on hand. ForeRunner™ has long been recognized as an ideal pre/post performance or training day paste by top professionals. However, it has a numerous “at home” applications, as well. ForeRunner™ is ideal at vaccination time, during/post injury or illness and is perfect for broodmares post foaling. It is a great support and recovery pre and post trail ride by reducing lactic acid build-up, additionally, ForeRunner™ is perfect for a variety of stressful activities including, weaning, trailering or relocation. Is It True That ForeRunner Is Only $19.99 and Has Multiple Doses? Does It Really Protect The Gut? Yes, Yes and Yes! Each ForeRunner™ tube is affordable-- usually retailing less than $20, and contains multiple doses, it provides critical gut support via Colostrum, prebiotics, equine specific probiotics and electrolytes, while BeneCell’s® nucleotides promote rapid cell regeneration, recovery, oxygenation and reduced lactic acid build-up. 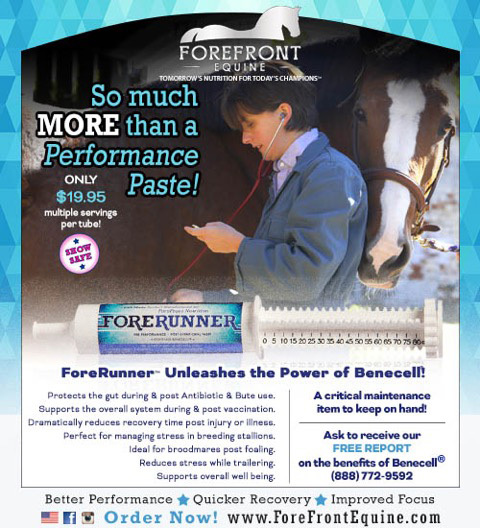 Thanks to the power of BeneCell®, ForeRunner™ will offer rapid cell recovery and regeneration, oxygenation, quicker recovery, reduced lactic acid build-up along with better focus, while the Colostrum, prebiotics and equine specific probiotics offer gut support during times of stress and help boost immunity. In short, you will have a horse that will feel good and perform to the best of its ability. How Long Should I Keep My Horse On ForeRunner™? Though ForeRunner™ may be used daily with no ill effects, it was primarily developed as a paste to be used on an as-needed basis. ForeFront Equine, LLC, the developer of ForeRunner™ offers a variety of affordable, all natural daily supplements ideal for performance and pleasure horses. All ForeFront Equine supplements may be used in conjunction with ForeRunner™ paste. What Other Uses Does ForeRunner Have? ForeRunner™ is also an ideal “at home” paste to keep in your trailer or tackroom to help your horse on training days, vaccination, during/post injury or illness, post foaling, trailering and more. It offers critical gut support via pre/probiotics and Colostrum to boost immunity, while BeneCell’s® quick- acting proprietary nucleotide-building formula promote increased cell regeneration, oxygenation and rapid recovery. It is a favorite amongst Performance Horse Trainers as well as Pleasure and Trail Horse owners alike. I Keep Hearing About BeneCell®, What Is It? ForeFront Equine LLC has established itself as a leading provider of innovative, all natural and healthy supplements. To that end, many of their products contain a proprietary ingredient called BeneCell®. Simply put BeneCell® is a blend of purified nucleotides and essential nutrients which have been shown to reduce the cellular damage that can occur during times of stress. Stress in horses comes in many forms including; performance, illness, disease, injury, trailering, relocation, etc. What Do Horse Owners Say About ForeRunner™? Whether trainers, exhibitors or pleasure riders, horse owners universally love the benefits of ForeRunner™ Paste. Top professionals like NFR 2014 World Champion Barrel Racer Fallon Taylor, International Champion Reiner Steve Kutie, and international Grand Prix Jumper Peter Petschenig swear by it. Each tube is affordable, offers multiple doses and is convenient to keep on hand. Whether your horse is working hard or hardly working, ForeRunner™ has an application in every conscientious horse owners’ maintenance or training regimen. What Does InfoHorse.com Say About ForeRunner™? Says Ann, Director, Our beautiful buckskin QuarterHorse/ Percheron, "DREAM" on the HOME page is such a wonderful horse-- but not to load into a trailer. No matter what we have tried or all the trainers we have used, DREAM has it in his "mind" that he is not getting in-- without a big hassel from us all. I tried FORERUNNER, out of desperation, 2 hours before loading DREAM into the trailer-- and was AMAZED at the results. DREAM still looked "upset" when he saw the trailer, but he walked calmly in-- and settled down almost immediately to munching hay. This was a MIRACLE for all of us who had struggled with this situation for years. We tried it several times; with FORERUNNER he loaded-- without FORERUNNER he did not. We are sold. What an AMAZING product! Don't Leave Things To Chance-- Have ForeRunner™ In Your Barn Today! At less than $20 and with multiple applications, why wouldn't you want to have ForeRunner in your barn. Any stressful situation, foaling, loading, traveling, competition, illness, training stress, trail riding, can be made better, and allow your horse greater focus, with ForeRunner! Not to mention all it's probiotic health benefits. Order today-- and be glad tomorrow! Send This Information To A Friend! We all learn something when we spend time with horses, so we will spread the knowledge in a more personal way through the newsletter. Your information is confidential and for the Newsletter delivery only. Special offers and fun in your e-mail. Contact Us to Advertise to over 2 million Horse Owners. All images and content Copyright© 2007 by InfoHorse.com, Equusite.com.